The Fraser Fir Tree was named for the late Scottish botanist, John Fraser (1750-1811) who explored and traveled throughout the southern Appalachian Mountains in the 1700's. Fraser found these remarkable trees throughout his travels and commented on their strong, tiny needles and amazing fragrance. Fraser Firs grow in a pyramidal shape; they can each a maximum height of over 80 feet tall, and their trunks can reach a diameter of 1-1/2 feet around. Their fast growth and strong branches that typically reach upward give them a compact form, with hardly any "holes" in between branches and needles. This combined with their fantastic fragrance, strong limbs and ability to retain their needles after being cut, with proper watering, are the main reason why the Fraser Fir Tree has long been used as a Christmas Tree. In fact, the Fraser Fir Tree has been used more times as the White House Blue Room Christmas Tree (considered the Official White House Christmas Tree of the President of the United States) than any other type of Christmas Tree species. The Fraser Fir loves the climate of the southern Appalachians and does particularly well growing in elevations above 3,000 feet. Regions with this type of topography typically experience lots of rainfall in the warmer months and a great deal of snow and cold temperatures in the winter months. A 6-7 foot tree has grown approximately 7 years on the tree plantation and is about 12 years old from seed! Annually, 50 million Fraser Firs are grown in North Carolina on more than 25,000 acres of farm land. The North Carolina Fraser Fir variety has been selected as the Official White House Christmas Tree numerous times, and last year was no different. Come and see our trees and you will find out what makes this variety of Christmas tree so perfect for use in your home! 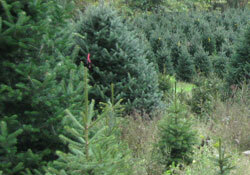 Our North Carolina Choose n Cut Christmas Tree Farm is located near Boone NC; in addition to selling Live Fraser Fir trees in various sizes, we also ship and sell decorated and undecorated wreaths, handmade Christmas ornaments, pottery and a variety of Christmas Tree accessories, including tree stands, at our farm. Visit our Christmas Tree Farm for plenty of seasonal holiday fun.